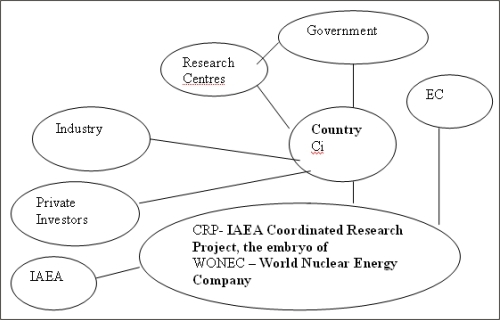 A preliminary program for research and development of the Fixed Bed Nuclear Reactor (FBNR) concept, within and based on the scope of the Co-ordinated Research Project on Small Reactors Without On-site Refuelling is defined below. 1 Comprehensive coordinated study of long-life cores for small reactors of various types with a focus on the issues posed by extended fuel burn-up. Inter-comparison of computer codes for neutronics, thermal-hydraulic, safety and mechanical design qualification of small reactor cores with extended burn-up of fuel. 1.1 Basic studies on the fuel type and method of securing reserve reactivity. 1.2 Study of the integrity of the fuel and cladding materials at very high fuel burnup using coated particle fuel. 1.3 Study of the fuel enrichment requirements within the scope of nuclear non-proliferation considerations. 1.4 Study of the method of securing reserve reactivity by fresh fuel insertion and utilization of burnable poison. 1.5 Neutronics calculations of FBNR. 1.5.1 Neutronics modeling and the choice of computer codes for the reactor core composed of fuel elements made from coated particles. 1.6 Thermal-Hydraulics calculations of the FBNR core. 1.6.1 Thermal hydraulics modeling and the choice of computer codes for the reactor core composed of fuel elements made from coated particles cooled by water. 1.6.2 Calculations of fuel and coolant temperatures under different operating conditions. 1.7.1 Safety analysis under various accident scenarios including loss of coolant accident, loss of flow accident, loss of power accident, anticipated transient without scram, and the safety against terrorist's actions. 1.8.1 Calculation of the thickness of the tubes that compose the core and the fuel chamber. 1.8.2 Calculation of the structures that support the reactor modules. 1.9 Conceptual Design A 3-dimensional design of the reactor concept is to be created using one of the existing computer assisted design codes such as Pro-Engineer Wild Fire. 2 Hydraulics study of the fixed bed suspended core concept. The IAEA Consultants participating in a Consultancy Meeting on Small Reactors without On-site Refuelling (March 2004), comment on the FBNR the followings: " In particular, the Consultancy noted that the innovative approach proposed in the Fixed Bed Nuclear Reactor (FNBR) concept ( Federal University of Rio Grande Do Sul, Brazil ) relating to hydraulically supported column of spherical fuel elements offers a good potential to serve as a method of passive control of core reactivity. This concept needs to be further developed and polished for its possible implementation in small reactors." Therefore, a full size experimental hydraulic module made of transparent materials using stainless steel balls to simulate fuel elements is to be constructed. The module is to be provided with instrumentations to measure the basic hydraulics parameters such as pressure drop as a function of coolant flow velocity under different core configurations. Videotape is to be made of the operation in order to analyse the core behaviour under various simulated operational and accidental conditions. 3 Comparative assessment of passive reactivity regulating systems. 3.1 Study of the various forms of reactivity control are to be made such as using f ine control rod in the centre of the module, use of absorber shell insertion, fixed bed level limiter, coolant pump flow controller, or using the coolant valve flow controller option. 4 Comparative assessment of several passive decay heat removal systems. 4.1 Study of passive cooling of fuel chamber being cooled by natural convection to air. 4.2 Study of fuel chamber being cooled by natural convection to water. 4.3 Study of the fuel in the fuel chamber being cooled by the water from an accumulator. 5 R&D on coated particle type fuel for water-cooled reactors. 5.1 Determination of the optimum size of the fuel element made from the coated particles for utilization in FBNR. 5.2 Method of fabrication of the large (about 8 mm) diameter fuel elements from coated particles. 5.3 Testing of the irradiated and non-irradiated fuel elements. 6 Participation of various countries around the world. There are many institutions in many countries that are showing interest in participating in the project. There are many financial sources and possibilities around the world that can be utilized. For example, i f at least 3 European countries take part in the project, the European Community will contribute with 50% of the cost. Many countries subsidize their clean energy related projects up to 60%. Others provide funds for research that will help elevate the level of science and technology in their countries. There exist many visionary private investors who may provide risk capitals. The nuclear industry and research institutions can make investments by supplying equipments, use of their facilities, manpower, and technology. In this manner, the necessary funds can be raised. As an example using the mentioned possibilities, an investment of $1 by the investor in country Ci attracts $1.50 from the government and thus results in $2.50 for the project. With the contribution of the European Community, it becomes $5.00. If 20 countries participate in this scheme, $100,00 becomes available for the project. Therefore, the investment of only $10,000.00 each by 20 institutions from industry, research centers, or private investors can raise $1,000,000.00 for the research and development of the project. The investments can be in the form of service, equipment, or money. A non-nuclear experiment is needed to be performed to observe the hydraulic behaviour of the system. Therefore, a full size experimental hydraulic module made of transparent materials using stainless steel and or lead balls to simulate fuel elements need to be constructed. The module should be provided with instrumentations to measure the basic hydraulics parameters such as pressure drop as a function of coolant flow velocity under different core configurations. A videotape is to be made of the operation in order to analyse the core behaviour under various simulated operational and accidental conditions.